Here is a complete guide to remote deposit capture systems, cheque scanning, cheque scanners and cheque imaging from The TALL Group and Digital Check Corporation. Our Remote Deposit Capture website has been created to provide you with the latest developments in remote deposit capture systems, cheque imaging, scanning and cheque fraud prevention software tools backed by market leading experience. The TALL Group is Digital Check’s preferred cheque scanner partner in the UK and a regional partner for West and Eastern Europe. The two companies work together to provide both hardware and software fulfilment solutions for cheque scanners, cheque imaging and remote deposit capture technology to both the financial industry and large corporate cheques users here in the UK and internationally. This site pools together the extensive knowledge and expertise of The TALL Group and Digital Check to provide a comprehensive resource for any organisation investigating cheque imaging, cheque scanning or remote deposit capture systems. For more information please click on the links below, or navigate using the menu bar above. Remote Deposit Capture (RDC) is the process of electronically depositing a cheque into a bank account from a remote location, such as at home or in an office, without having to physically deliver the paper cheque document to the bank. This is typically achieved by scanning a digital image of a cheque into a computer, tablet or mobile phone, then transmitting that image to the bank. The Image Clearing System (ICS) went 'live' in the UK in October 2017, with the cheque clearing industry committed to exchanging cheque images and data, instead of a physical paper document. This first stage was enabled by legislative changes laid out in the Small Business, Enterprise and Employment Bill 2015. From October 2017, all banks will be required to clear some cheques based on just the image of the document and data files alone, and limited paper cheques will be exchanged between banks. By the end of 2019, all banks will be required to clear all cheques by the image alone. No paper cheque documents will then be exchanged. One of the main benefits of an image-based system is that the cheque clearing process will be speeded up allowing faster access to funds. It means that if a customer pays in a cheque on a weekday (Monday to Friday) and it is cleared via the new image clearing system, then they will be able to withdraw the funds by 23.59 on the next weekday (excluding bank holidays) at the latest. Cheque imaging is also about providing customers with more choice, and it means that some banks and building societies may offer their personal banking customers the additional option of paying-in an image of the cheque - by using a secure mobile banking app on their smartphone or tablet - rather than having to go to a bank branch to pay it in. 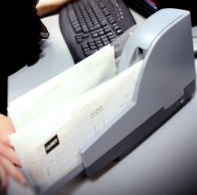 For business and charity customers, banks may provide desktop cheque scanners linked to their online bank account, allowing them to pay in, as digital images, large numbers of cheques that they receive at their business premises. See our range of cheque scanners suitable for high, medium and low cheque volumes. The TALL Group's partner, Digital Check, provides superior cheque scanners and document capture products for teller/cashier capture, branch automation, remote deposit capture, and remote drop/lockbox applications. IDigital Check's award-winning CheXpress®, TellerScan®, BranchXpress®, and SB Series cheque and document scanners are among the most cost-effective and reliable in the industry, and provide high-quality images with precise MICR and optional UV image accuracy. In September 2016, Digital Check acquired the SmartSource® line of scanners, sorters, and printers from Burroughs Inc., further solidifying its position as an international leader in cheque image capture.